We don’t know about you, but nothing puts quite as much pep in our step as indulging in the two-for-one punch of Irish coffee. A little booze with our caffeine? Yes please! 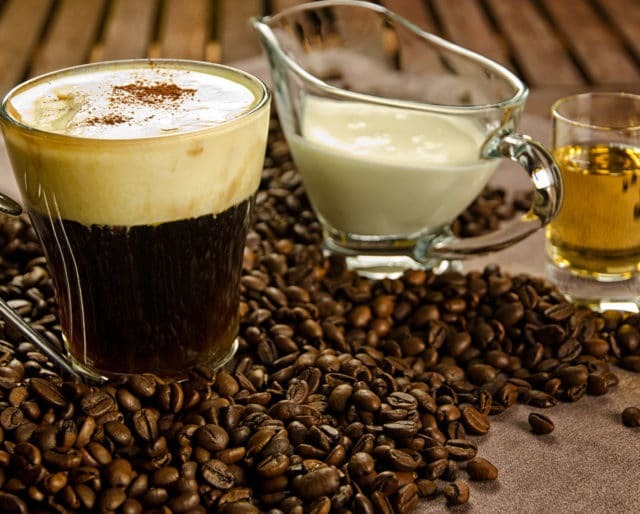 Although there are certainly a few different variations out there, Irish coffee traditionally consists of black coffee, whiskey, sugar, and whipped cream. National Irish Coffee Day is celebrated on January 25, and we think that it’s the perfect occasion to warm yourself up with a tasty, boozy treat. ​Chef and bartender Joe Sheridan served airplane passengers the first ever Irish coffee after the flight was turned back due to bad weather. It's hard to think of a better way to celebrate National Irish Coffee Day than by indulging in a giant cup of Irish-y coffee goodness. Kick back, relax, and savor the flavor. Whiskey preferences can greatly vary from person to person. In order to find the combination of Irish coffee ingredients that are best suited to you, some trial and error is necessary to find the perfect whiskey brand and amount that you like in your drink. We're not complaining about the taste testing, though. What better way to honor Irish coffee than by making a trip to Ireland. Indulge in some whiskey and coffee while gazing at the gorgeous countryside. We promise not to judge if some pints of Guinness accompany your Irish coffee. The 4 Best Places To Get An Irish Coffee In The U.S. They take pride in brewing high quality coffee, allowing you to choose your favorite whiskey, and topping it all off with mixing cream. Not only do they serve up delicious food and thirst-quenching pints of Guinness, but we've also heard that they do an awesome Irish coffee. Sure, there's something extremely satisfying about sipping a hot Irish coffee during the cold and frigid winter months, but it's also a great drink during the warmer months as well. We don't know about you, but we drink coffee throughout the year — the addition of whiskey, sugar, and whipped cream are certainly welcome too. There are some cocktails out there that seem to have a never-ending recipe list and/or way too many steps. Not Irish coffee, though. Almost anyone can make this yummy, warm drink. Just pour some whiskey into a mug with coffee, spoon in a little bit of sugar, and top it all off with a hefty dollop of whipped cream. Put simply, Irish coffee is just plain good. Whether you're indulging in an early morning pick-me-up, or treating yourself to an after-dinner beverage, Irish coffee tastes great.